As you can read elsewhere, all patrol cars in the UK are only able to use time and distance devices, which are nothing more than glorified stopwatches. If you look at the frames from our ProVida traffic video you'll note that each frame has a unique sequential frame number - it's in the top right hand corner just below the clock. The number 39 below that is the zoom setting of the video camera. By using the frame number and the output from the patrol car odometer it's possible to manually calculate the actual average speed of your vehicle. The odometer records distance to a thousandth of a mile. The patrol car speedometer is the least accurate of all the information recorded on the ProVida screen. The target vehicle average speed is calculated to 0.01 mph. It's then possible simply to reproduce what the time and distance device does if the traffic officer has used it correctly. All calculations that PePiPoo provide will have been prepared by degree qualified engineers or traffic officers. Frames are used where a shadow from a gantry (or similar marker) darkens the rear window of the "target vehicle". The time is noted in seconds from the clock plus the incremental fraction of a second by advancing the video one frame at a time until the clock advances to the next second. The video is PAL format so there are 25 unique frames per second, which means that time can be measured to a 0.04 seconds. Next the video is advanced until the patrol car reaches the same point, and we note the distance from the odometer. Then the clock reading is noted from the second marker as the target vehicle passes it in the same way as 1. Finally the odometer reading is noted when the patrol car passes the second point. Now both the time and distance between the two markers have been measured, so the average speed can be accurately calculated. 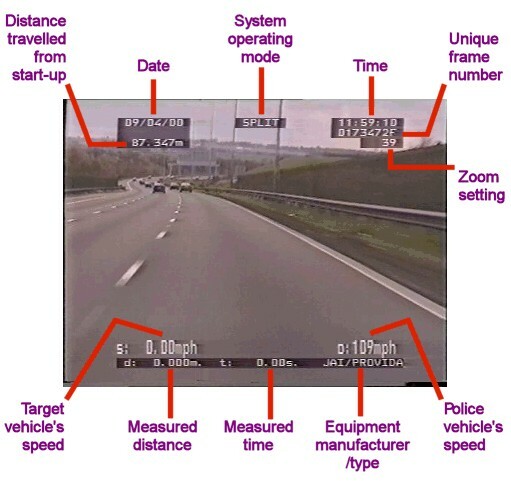 Traffic Videos recorded by static speed measurement equipment, such as some laser guns, record time and distance very accurately. However, unless the measurement was taken from directly in front of or behind the target vehicle, the distance information will be of little use when calculating the average speed of that vehicle - the "Cosine Effect". If you look at the diagram you'll see that if the two distance measurements (D1 and D2) are subtracted they won't give a true measurement of the actual distance travelled by the target vehicle. The problem is further exacerbated if the carriageway is not perfectly straight. When PePiPoo analyse your traffic video markers will be identified on or near to the carriageway, between which it will be necessary to obtain accurate distance measurements. Competent traffic officers in the Constabulary concerned will understand this effect and should agree to assist you by providing the required distance measurements. 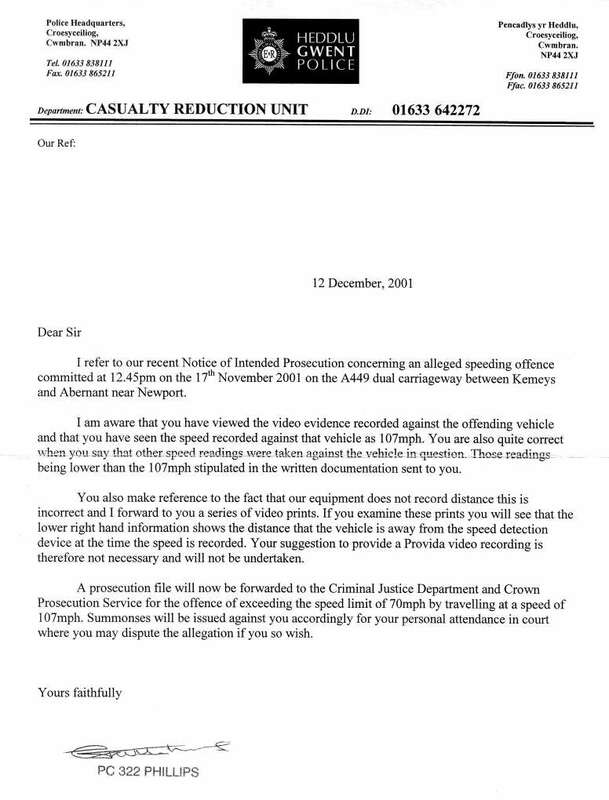 However, as this letter demonstrates some Constabularies' traffic officers may need a little help understanding this principle! This link has more information on the LTi 20/20 laser speed-measuring device.